Port view of the side showing the flared section of the hull. The flared hull increased the hangar deck are and counter-balanced the island weight. I added a piece to the hangar deck to build it out to the right dimensions, then filled with Apoxy Sculp and sanded the flare to shape. Starboard side view at this stage of construction again with the first island. View underneath showing where the hull was shortened. 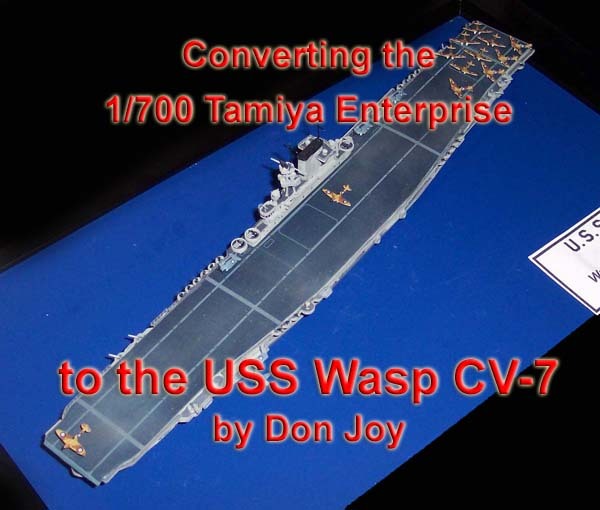 Wasp is 82 feet shorter than Enterprise, which is 1.4 inches in 1/700 scale. Beam is only 2.1 feet difference, or .03 inches in 1/700. That is lose enough I decided not to replicate it. One more Port view to illustrate the hull flare again. The Island: I didn’t like how it was shaping up using the kit pieces, so I decided to build it up. I found Evergreen the right height for a level and right width. Here are the pieces I collected from the kit plus the Evergreen. The stack is the red splotch. Basic island construction in the process of being filled. Gray bits are from the kit. Island with stack on the deck. Same stage of construction, top view. Inboard view of Island. Tom’s Modelworks hatches added. Ladders from spares box. The Wasp had a unique deck edge elevator. This was a feature I wanted to show on the model. Picture of the elevator. The finished island and all the small bits are in the box. Close up of finished Elevator with Dauntless. I used a couple of catapults to make the arms of the elevator, which are too thick. At this point, I just decided to go with it. Elevator mounted on the hull. Some final test fits while I was installing the railings. Test deck spot of the Spitfires. Another view of the test fit. Good view of the deck markings. Deck markings were laid out on the computer and printed on decal film. The while lines become clear on the decal, so the deck is painted that color. Finished model with Spitfire clearing the deck forward and one lifting off near the island. Starboard view. You can see the life rafts, ship’s boats, cranes all added. Finished model with the Trumpeter Yorktown hull and deck to show the difference in size between the two. More of Don Joy 's work.